It’s been four short months since Red Dead Redemption 2 released, and while we saw some minor discounts go live around Black Friday, none were as good as the deal available right now. Over on Amazon and GameStop, physical copies of Red Dead Redemption 2 can be purchased for $39.99, or $20 off the game’s original price. One thing that’s interesting is the sale only applies to physical copies, rather than digital. Of course, for those looking to surprise a loved one with a new game this Valentine’s Day, unwrapping a physical copy of Red Dead Redemption 2 is likely to be more satisfying than redeeming a digital code. 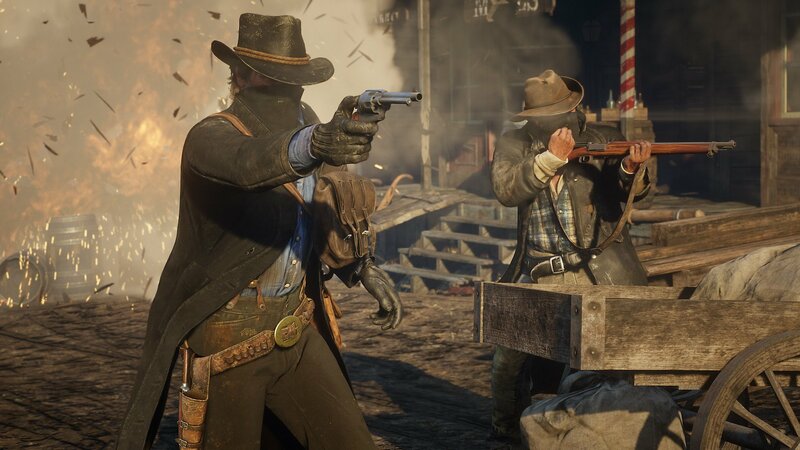 Additionally, both Xbox One and PlayStation 4 copies of Red Dead Redemption 2 are on sale, meaning you’ll be able to take advantage of the $20 off discount regardless of platform. It’s unclear how long the sale (and supplies) will last, so if you still need to grab Red Dead Redemption 2 we recommend doing it sooner, rather than later. To help make the process easier, we’ve included links to where you can purchase Red Dead Redemption 2 for $39.99 down below. Physical copies of Red Dead Redemption 2 are on sale for $39.99 at GameStop and Amazon. For those on the fence, Red Dead Redemption 2 was one of our favorite games of 2018. Not only did it serve as the perfect follow-up to the original Red Dead Redemption, it offers a wealth of content for gamers to enjoy from a memorable story campaign, to fun fishing and hunting mechanics. Red Dead Redemption 2 owners also have access to an online component, Red Dead Online. While Red Dead Online has had some minor issues following its launch, particularly in regards to the in-game economy and player griefing, it’s still a solid addition to the Red Dead Redemption 2 experience as a whole. If you’re sold on Red Dead Redemption 2, be sure to let us know down in the comments below if you were able to snag a copy at a discounted price of $39.99 rather than $59.99. For more on Red Dead Redemption 2, be sure to check out some of our previous guides including our comprehensive guide to horse taming and bonding in Red Dead Redemption 2, where to find Gavin in Red Dead Redemption 2, and whether or not you can buy a prostitute in Red Dead Redemption 2.